Catching Shrimp with Bare Hands: A Boy from the Mekong Delta is the true story of a boy growing up in the midst of the Vietnam War and his struggle for freedom after the Communist takeover. Catching Shrimp with Bare Hands is available at Amazon in print and Kindle versions, as an iBook, on Google Play, and in local bookstores. This is an interesting book with a unique perspective. A child’s look at war and politics, what it means to the people who actually have to live day to day with conflict. Well worth reading and insightful. Thank you for reading it! I appreciate your comments. 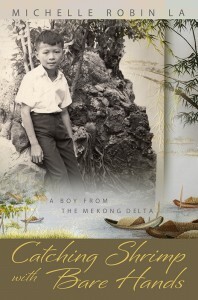 It really transported me to the Mekong Delta and made this a “can’t put it down” book. The escape by boat made me remember when I was a cadet on container ships sailing from Hong Kong to Singapore. We always were watching to see if there were any refugee boats during our transit. I remember thinking about how hard it would be to leave everything behind and try to make a new life in a different land. Now I have a very small idea of what this was like. My wife, Susan Boyd, went to school with Hang and Young. Having some small connection to the La family really brings home how small and interconnected this world truly is. Thank you for the excellent read! Thanks, Chuck! I really appreciate your comment. When my husband finally was out on the ocean, a group of Thai pirate ships started to chase his boat. A large freighter appeared and stopped right in front of Luong’s boat. The captain of Luong’s boat stopped too, and they stayed together at a distance. As soon as the pirates were past the horizon, the freighter went on its way. Luong’s family was extremely fortunate. So many boats were rammed by pirates and the people left to drown. (This was the large “half-legal” boat that Luong left on. Hang and Young were on the small black “illegal” boat.) Luong remembers the Boyd family. The world can really be a small place sometimes!